My full name is CH Finnshavn Robinhood Firefly CGC, but call me Sparkey for short. I am almost 12 years old. I live with mummie and daddy and cousin Hughie in Tsawwassen, BC. "CH" means I'm a Champion. Yes, I was a show girl in my younger days. Here's a picture of me back in those days. I belonged to Charlie MacInnes near Toronto and I used to enjoy going with him to the dog shows. I especially liked getting brushed to look my best for the shows, and to this day I still love to be brushed. I had two litters with 21 babees altogether. 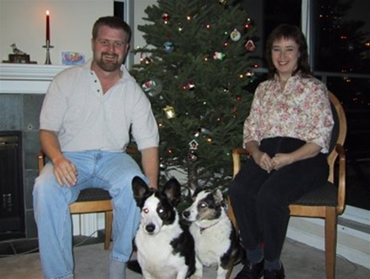 When I was 5, I retired from motherhood and Charlie gave me away to Kathleen Stewart who lives in British Columbia with her husband Ron (mummie and daddy for short). 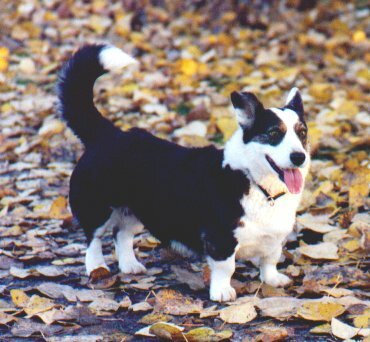 They have a black and white corgi like me named Hughie. It took me a few days to get used to my new home, but I soon realized these people loved me (everyone does!) and were going to take good care of me, and I never looked back. I was glad to get away from those mean, bossy and pushy females that Charlie also kept, one of whom once bit off the tip of my right ear. Now I get lots of attention and I can boss Hughie around. It's just "we four" and I love it. When mummie asked Charlie how I could be so sweet, Charlie said I was born sweet. Oh, and the "CGC" means Canine Good Citizen. I earned that title with mummie, and at the same time Hughie earned that with daddy. Hughie has all kinds of other titles he got when he was younger, but he's retired now, too.